When mapping out the interior design scheme of a room, it is vital to use furniture that achieves a twofold effect: as eye candy for the room and providing the kind of comfort and functionality we expect from furnishings. This role should be no different with lighting. Lighting fixtures have the same ability to decorate a room and make it feel congenial. 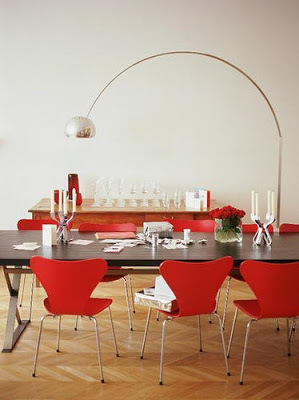 The Arco lamp replica, our stunning reproduction of the Castiglioni Arco lamp, is loyal to the original design. 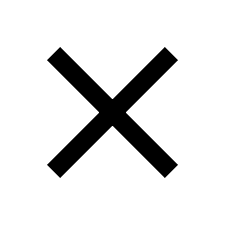 It also follows this crucial furniture duality, which cannot be said about most lamps. The long, sleek body of the Arco lamp and its signature curve make it a looker. Its unique shape is not just a pleasant aesthetic, it helps light a table, chair or other space that requires extra lighting that may not be fulfilled by a ceiling lamp. Finding other furniture to place by the Arco lamp can be challenging. Decisions will beg several questions, such as whether a particular piece will clash with the lamp, or if it is not stylistic enough to be in the same area as the lamp. Besides particular pieces of furniture, groupings can also be a challenge, both space and money-wise, since there’s more than one piece to consider. Take a look and see which design schemes adapt the Arco Lamp well. A metallic body and a white base with black smears, or a black base, are features that make the Arco lamp appropriate for colorful rooms. The pastels and the dark blue are an eye-catching and fresh take on the traditional living room. The position of the Arco lamp, a profile view in which the light is directed at the table fulfills the twofold purpose; it lightens the center Tulip table (its book stack is telling of a need for extra light) while showing off its curved shape for those entering the room. 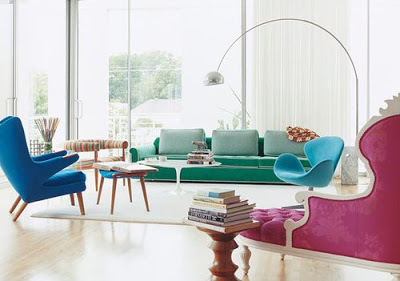 With the different colors, it’s only natural that the furniture here does not go by a grouping, but rather distinct shapes, such as the Swan chair and the other lounge chairs. Usually, a dining table or set of chairs are a dining room’s most notable trait. Sometimes a nice sideboard or sideboard will stand out the most. But in this dining room, the star of the show is the Arco lamp, adding midcentury marvel to an otherwise plain dining room. The red chairs are a nice touch to the dark wood table and compliment the flowers atop the table and the red glasses on the credenza. The candles give an element of elegance while unlit; they’ve no need for it in the presence of the beaming Arco lamp. The Arco lamp can be turned slightly towards the table to minimize its profile look while also maximizing the light the table receives. The Arco lamp commands the most attention in this small, alcove-esque setting with closely-seated chairs. This setup is ideal for communication between a small group. Without the Arco lamp and its statue-like aura, this space would be rather bland. The lamp serves as a decorator and as an additional light, as this setup is near a window. Our womb chairs mimic the look of these chairs with its rounded shape and padding. The rug adds additional comfort to room and stays true to the light color scheme. 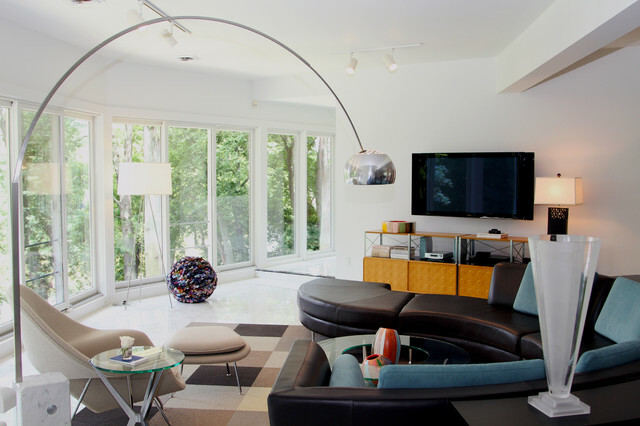 The Arco lamp manages to sit well beside a sectional, a large swirling couch in this scenario, without cramping tis style. 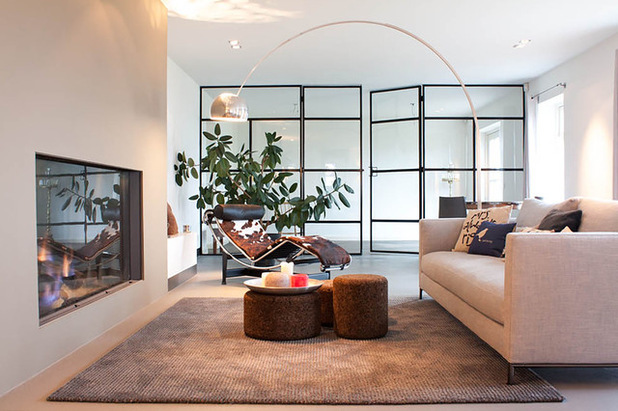 The Arco lamp is the missing piece in this living space, as a Womb chair and a sectional alone would be a lacking setup. Standing next to a small glass side table, the marble base of the Arco lamp is a kind of side table itself, a unique block of genuine marble that contrasts with the stem’s stainless steel, which also shows this creativity behind this lamp. There is no other lamp, or furniture piece for that matter that would enliven this setup. Notice that there already are two lams, including another floor lamp, but none catches the eye as strongly as the Arco lamp. The Chaise lounge replica, a replica on the notable LC4 chaise of Le Corbusier’s LC collection takes center stage here…largely in part of the Arco lamp. The Arco lamp, set at its profile to reveal its curve and the leafy plant behind the LC4 chaise lounge make this lounging area the focal point. The loft couch is decorated by a few pillows and the centered tables. If viewed from another angle, one in which the couch is in the center, the Arco lamp’s base makes a good alternative as a side table to the couch. Since the couch is positioned in front of the fireplace, it needs no other parallel couch or chair.